- Kyerivs wireless usb wifi adapter come with the newest and powerful Wi-Fi technology, it is ideal for seamless HD streaming, online gaming and other bandwidth-intensive tasks. - The 5GHz 867Mbps is perfect for HD video streaming and lag-free online gaming, while using 2.4GHz 300Mbps Wi-Fi for normal use such as web surfing. - Whenever there is only wired Internet connection, you can activate the SoftAP function after installing the included CD software, and create a Wi-Fi hotspot for other mobile devices. *Compact design for easy carrying. ☛USB3.0 interface,which makes the transmission rate more efficient. 【ULTIMATE POWERFUL ANTENNA】- Stronger penetrate ability, high Gain Long-Range 5dBi Antenna provide better performance for signal connection even signals are weak. Perfect for Lag-free HD Video Streaming and Gaming. It can be rotated for picking up the best signal. 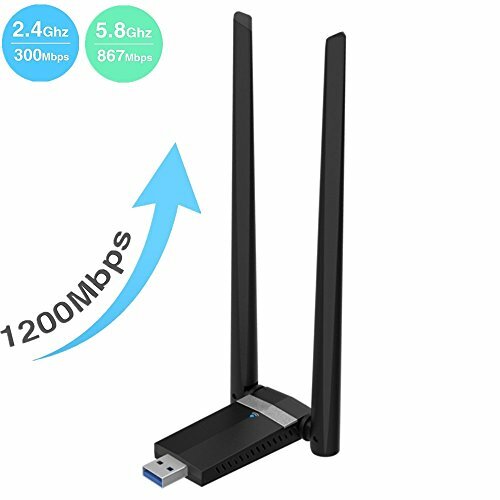 【WORKS WITH ANY ROUTERS】- Using AC1200 AC wireless network adapter, you can upgrade your Desktop, Laptop, PC or Mac to work with AC wifi router for faster speed and extended range. High-end wifi technology ensure the quality of the products, bring you excellent life experience. 【100% WORRY-FREE GUARANTEE】- We're sure about the quality of our wireless usb wifi adapter, so we provide free money return and replacement . Please feel free to contact us if you have any problem, we will provide you lifetime guarantee with 24 hours bestest friendly customer service. If you have any questions about this product by Kyerivs, contact us by completing and submitting the form below. If you are looking for a specif part number, please include it with your message.